Poignant story-songs of real-life people who have overcome great challenges in their lives, with tight harmony vocals, folk harp, mandocello and guitar. These are songs of strength, courage, hope, kindness, and determination. Loretta wrote each one about real-life, ordinary people, who turned out to be extraordinary. Backed by an Artist Initiative grant from the Minnesota State Arts Board, she sought out people who had overcome great challenges in their lives and come out stronger for the journey. She interviewed each one, and crafted their story into a song. The stellar cast of characters includes a woman who donated a kidney to a toddler she didn’t know; a native American man who grew up at the state orphanage in Minnesota amid great discrimination and abuse; a woman who grew up in great hardship in the grasslands of Somalia and is now a nurse at Mayo Clinic; a long lost love story of a couple who met in their 20s, lost touch and married in their 60s; one of the worst injured of the 35W bridge collapse survivors in Minneapolis; plus many more. The recording features ace Prairie Home Companion fiddler Peter Ostroushko on five tracks, and outstanding bowed cello player Jacqueline Ultan on three tracks. Sandy Njoes plays bass on 9 tracks, Sherri Leyda plays penny whistle on one track and hand drum on one track, Chuck Leyda plays mandolin on one track, and Bobb Fantauzzo plays Native American style flute on one track. Minnesota Bluegrass Magazine says, "These are amazing stories….and each one is more powerful than the last….it's the best, most poignant, most powerful album of the nine this duo has recorded over the last quarter century. Loretta's songwriting has improved steadily over the years and now, a hundred songs later, it sparkles." 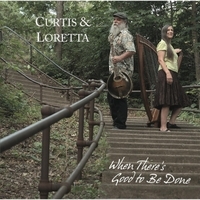 Besides Curtis & Loretta's extraordinary vocal harmonies, they accompany themselves on this recording on folk harp, mandocello, folk harp, and claw hammer banjo. In 1977, a theater graduate was sitting on a beach in Santa Cruz, California playing her guitar, practicing for a variety show. A young Texan who had just returned to the mainland from Hawaii stopped and said, “Hey, I play guitar!” And he did! They sat down together on a piece of driftwood and as they sang, they couldn’t help but notice how well their voices meshed. They played together at the variety show that night, and have been singing together ever since, as the duo Curtis & Loretta. They received an Arts Tour Minnesota grant from the State Arts Board in 2010, and were named “Best Acoustic Performers of the Twin Cities” by City Pages in 2002. Their CDs have appeared on “Top Albums of the Year,” at folkradio.org, and they’ve received several nominations for Best Acoustic Folk Artist for the Minnesota Music Awards. They have released 8 CDs, and shared billings with such luminaries as Pete Seeger, Arlo Guthrie, Holly Near, Vassar Clements, Claudia Schmidt, and many more! Curtis Teague and Loretta Simonet were married (to each other!) in 1987, and live in Minneapolis.